Cascais is a delightful Portuguese fishing town, which has an extensive history and is situated close to some of the finest beaches of the Lisbon region. The charming old town centre of Cascais contains a range of interesting tourist attractions and monuments, while the surrounding coastline offers beaches to relax on and pleasant hiking routes. There is a lot to see and do in Cascais, and this has transformed the town into a respected holiday destination and popular day trip from Lisbon. This guide will detail the main sights and attractions of Cascais. Cascais has a series of wonderful beaches and a full guide to the beaches of the Cascais-Estoril-Lisbon coastline can be found here. Within walking distance of Cascais are four medium sized beaches that provide golden sands, clean sea waters and great tourist facilities of bars, cafes and restaurants. These beaches are family friendly as they have calm sea waters but the beaches can get very busy in the height of the summer due to the close proximity of Cascais and Lisbon. To the north of Cascais the beaches face the might of the Atlantic Ocean and are pounded by huge waves, making them ideal for surfing. The northern beaches lie within the Sintra national park and the beaches retain their “wild and rugged” appeal as there is virtually no tourist development. The best of these beaches is Guincho 8km north of Cascais. The Boca do Inferno (Hell’s Mouth) is series of the highly weathered cliffs 2km to the north of Cascais. The main feature is a collapsed cave where the huge waves of the Atlantic Ocean smash against the rock face. The area is popular with Portuguese fishermen who risk serious injury clambering over the slippery rock faces. It is a pleasant 15 minute walk to the Boca do Inferno from the marina and follows the coastal road. A cycle path connects Cascais with the surfing beach of Guincho. This bike ride is an enjoyable half day activity and is suitable for cyclists of all abilities. The purpose built cycle path follows the coastline for 8km and along the route are multiple side excursions including; handicraft markets, fortifications, lighthouses and unique cliff formations. Free bikes can be rented in Cascais and for a guide please click here. The Condes de Castro Guimarães museum is housed in a delightful mock gothic castle that was constructed in 1902 by an Irish tobacco millionaire. On his death the building was given to the council of Cascais who transformed it into a public museum that display furniture and art from his personal collection. 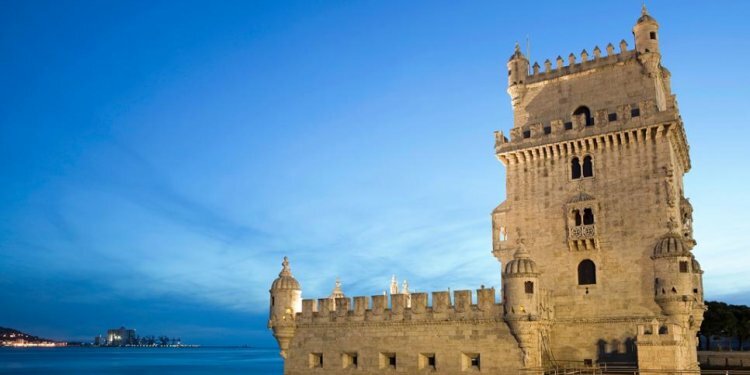 The highlight of the museum is a 16th century manuscript, which displays one of the oldest images of Lisbon. The ornate house is located in the Marechal Carmona gardens which were once the grounds of the house. There is an enjoyable short walk that follows the coastline between Cascais and Estoril. The route follows the beach front promenade and passes grand 19th century houses, a seawater lido and numerous relaxing beach front cafes and bars. The walk takes around 30 minutes and from Estoril train station it is possible to catch the train back to Lisbon. For a guide please click here. The Cabo da Roca is the most westerly point of Portugal and Europe. This barren wind blasted landscape of massive cliffs and raging seas makes for a good excursion from Cascais. The main attraction of the area is the raw power of nature as the massive waves bound the 100m high cliffs of highly faulted rocks. Following the cliffs are numerous hiking trails that cross the exposed national park. Cabo da Roca as a day trip from Cascais is designed for nature lovers or hikers. This small but informative museum documents the history of the fishing community of Cascais and fishing in Portugal. The second room contains ocean based exhibits and a selection of models of boats. The entire museum can be easily seen in less than 30 minutes and is a pleasant side excursion while in Cascais. The Casa de Santa Maria is another grand 19th century residence that is open to the public. From the upstairs windows the house offers great views over the marina and the Cascais coastline. The most notable feature of the interior are the decorative tiles patterns. Opposite the Santa Maria is the blue and white light house, which also contains a small museum. The Parque Marechal Carmona are the pretty gardens that were the grounds of the Condes de Castro Guimarães house. These tranquil gardens include a duck pond, petting zoo of domestic animal and flower gardens. The park is pleasantly clam, with peacocks slowly strolling and Portuguese families enjoying picnics.